Oil extracted from the fruit of rose plants [known as rosehips] contains compounds with many therapeutic uses. Rosehip oil is high in fatty acids, including linoleic, oleic, and alpha-linolenic acids. Fatty acids are known to moisturize and restore skin barrier function. The oil also contains trans-retinoic acid, a precursor of vitamin A, which is known to help restore skin tissue. The oil is widely known to reduce the appearance of scars by reducing their profile, decreasing hyperpigmentation, and increasing skin elasticity. It can also reduce the effects of premature aging and sun damage. Rosehip oil has been shown to have anti-inflammatory properties. Rose plants [from the genus Rosa] contain 150 species in Europe, Asia, and North America . Rosehips are the pseudo fruit of rose plants. They are used in traditional cultures as a tea or vitamin supplement . Rosehips are known for having high amounts of vitamin C . Rosehip extract has been shown to have antioxidant properties, attributed most often to vitamin C content [8, 11]. However, the therapeutic properties of oil extracted from rosehips have also been explored. Rosehips are 6.5-12.9% oil . The highest amounts of oil [>10%] are found in R. canina, R. dumalis, and R. subcanina variations . The oil from rosehips contains no vitamin C, as vitamin C is soluble in water and not oil. The oil is about 70% unsaturated fatty acids [3, 7]. Fatty acids are known to smooth the skin, repair damaged tissue, and overall revitalize the skin . They are highly moisturizing and protect the outer barrier of the skin from damage . Rose hip oil contains high amounts of linoleic [omega-6], oleic [omega-9], and alpha-linolenic [omega-3] fatty acids . It also contains gamma-linolenic acid, an omega-6 fatty acid, which is known to have anti-inflammatory effects . Rosehip oil has a significant amount of trans-retinoic acid, a precursor of vitamin A  Trans-retinoic acid is known to aid in restoring and rebuilding tissue . This component also adds to the stability of the oil . Linoleic and alpha-linolenic acids from rose hips were shown to have anti-inflammatory properties. Fatty acids inhibit the arachidonic acid pathway. Arachidonic acid is made into prostaglandins, inflammation mediators . Both linoleic and alpha-linolenic acids were shown, in vitro [outside the body], to inhibit the enzyme COX-2 that is responsible for converting arachidonic acid into prostaglandins [6, 11]. Also, rosehip extract has been shown to inhibit certain inflammatory mediators involved in inflammation in vitro . These inflammatory mediators decrease the production of collagen, thus rose hip oil may help increase collagen production and protect existing collagen from damage. In a clinical study, rosehip seed oil shows promise for inflammatory skin conditions such as eczema, ulcers, and cheilitis [lip inflammation] . Rosehip oil is known to improve the appearance of scars. In clinical studies, rosehip oil reduces the appearance of surgical scars [4, 5]. In this study, skin elasticity and smoothness improved. A surgeon with experience treating scars reported rosehip oil reduced tension in radiation scars . Another surgeon noted rosehip oil’s usefulness for treating burn scars . Rosehip oil was shown to reduce redness and hyper-pigmentation in scars and loosen fibrous cords associated with scaring . Researchers attribute this scar-reducing effect to the presence of trans-retinoic acid . In addition to helping reduce scar appearance, rosehip oil has other therapeutic effects. A cream containing rose hip oil was shown to reduce the signs of premature skin aging . 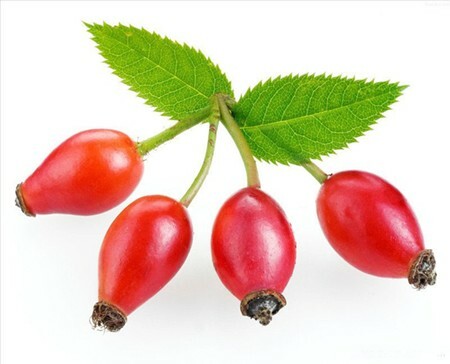 Rosehip oil reduces the appearance of photoaging, chronic damage to the skin due to excessive sun exposure [4, 5]. It decreased surface wrinkles in patients with photoaging and increased skin elasticity . Rosehip oil also has anti-microbial effects. In an in vitro study, rosehip seed oil killed yeast . The oil should have a distinct odor but not a sweet rose fragrance. If you smell roses, the manufacturer added fragrance, and the oil probably is not genuine rose hip oil. Place some of the oil on a white surface and look at the color. Rose hip oil is naturally a reddish hue, although a cold-pressed oil can be strained or refined into a clear oil. If the oil has a reddish color, it is more likely to be cold-pressed. Rose Hip Oil oil should have a distinct odor (best described as fishy). Despite the name, RoseHip Oil does NOT smell like roses. If you have bought Rose Hip Oil with a sweet rose fragrance then the manufacturer added fragrance, and the oil probably is not genuine rose hip oil. Despite the name, Rose Hip Oil does NOT smell like roses. C. Chrubasik, B.D. Roufogalis, U. Müller-Ladner, and S. Chrubasik, “A Systematic Review on the Rosa canina Effect and Efficacy Profiles,” Phytotherapy Research, vol. 22, pp. 725–733, 2008. I. Çınar and A.S. Çolakoğlu, “Potential Health Benefits of Rose Hip Products,” Acta Hort. [ISHS], vol. 690, pp. 253-258, 2005. J. Concha, C. Soto, R. Chamy, and M.E. Zúñiga, “Effect of Rosehip Extraction Process on Oil and Defatted Meal Physicochemical Properties,” Journal of the American Oil Chemists’ Society, Vol. 83, no. 9, 2006. A.C. Dweck, “The role of natural ingredients in anti-ageing of the skin,”­ Australian Society of Cosmetic Chemists Annual Congress, transcript, Hamilton Island, 2003. F. Lattanzioa, E. Grecob, D. Carrettaa, R. Cervellati, P. Govonic, and E. Speroni, “In vivo anti- inflammatory effect of Rosa canina L. extract,” Journal of Ethnopharmacology, vol. 137, pp. 880– 885, 2011. R. Nowak, “Fatty Acids Composition in Fruit of Wild Rose Species,” ACTA Societatis Botanicorum Poloniae, vol. 74, no. 3, pp. 229-235, 2005. I. Roman, A. Stănilă, and S. Stănilă, “Bioactive compounds and antioxidant activity of Rosa canina L. biotypes from spontaneous flora of Transylvania,” Chemistry Central Journal, vol. 7, issue 73, pp.1-10, 2013. A. Saha and S. Sher, “Acne Treatment,” United States Patent Application, pp. 1-6, June 2011. M. Shakibaei, D. Allaway, S. Nebrich, and A. Mobasheri, “Botanical Extracts fromRosehip [Rosa canina], Willow Bark [Salix alba], and Nettle Leaf [Urtica dioica] Suppress IL-1β-Induced NF-κB Activation in Canine Articular Chondrocytes,” Evidence-Based Complementary and Alternative Medicine, pp. 1-16, 2012. E.M. Wenzig, U. Widowitz, O. Kunert, S. Chrubasik, F. Bucar, E. Knauder, and R. Bauer, “Phytochemical composition and in vitro pharmacological activity of two rose hip [Rosa canina L.] preparations,” Phytomedicine, vol. 15, pp. 826-835, 2008. Pareja, B., Kehl, H., Contribución a la Identificación de los Principios Activos en el Aceite de Rosa aff. rubigonosa, Anales de la Real Academia de Farmacia, 56, 283 (1990).